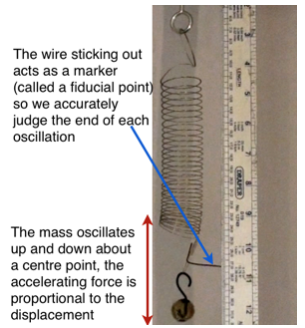 The SHM of a mass oscillating on a spring is the most common example used in schools and colleges because it is simple and easy to set up and it completely matches the conditions for simple harmonic motion. That is, providing the mass of the spring is insignificant compared to the mass on the end. This gives you the connection between the time period for one oscillation T , the mass oscillating m and the spring constant k, of the system. is the force required to displace the mass (stretch the spring) by one metre. We can use this equation to calculate the time of one oscillation of a mass on the spring if we know the spring constant K. The value of k is the force needed to stretch the spring by 1m, an amount which would almost certainly destroy the spring. We actually find the value by measuring the force for a smaller extension and calculating the value for 1 metre. 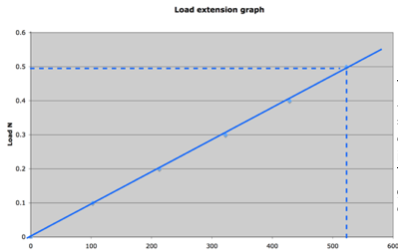 To do this we graph the results and so avoid any major errors. The points plotted should all be very close to or on a straight line. of a spring is for one complete oscillation. From a point and back to that same point traveling in the same direction. For example from the centre to the bottom, back to the centre, to the top and back to the centre again. So that we get an accurate value of one oscillation we measure a lot (perhaps ten or twenty) and then divide. The end points of the oscillation are accurately marked by a fiducial point. The larger the mass, the slower the oscillation and the longer the time period because a larger mass will accelerate less with the same force. The amplitude (that is the distance from the centre point to one end) makes no difference to the time period. If the amplitude is large the mass has a greater distance to travel. But the forces are greater and therefore the acceleration and speed are greater so the two cancel out.